port of spain | Blah! NBA Hall of Famer, political activist, and now accomplished author. Kareem Abdul-Jabbar can do it all. With Anna Waterhouse, he takes us on an adventure starring that other Holmes brother, Mycroft. In the original Sherlock Holmes stories, Mycroft is the older brother of Sherlock, mysteriously working for the government. He has powers of observation and deduction maybe even greater than his brother’s, but being out of shape, he prefers to work behind the scenes in the service of Her Majesty’s government. 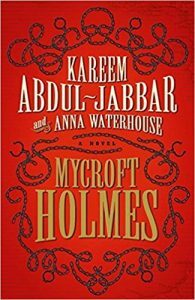 In this novel, entitled, fittingly, Mycroft Holmes, Abdul-Jabbar and Waterhouse tell the tale of a younger Mycroft, at at time when Sherlock is still a student and Mycroft has just begun working for the government. However, he is soon pulled into a larger adventure spanning half the globe that takes him to the original home of his fiancée and, coincidentally, his best friend Cyrus Douglas: Port of Spain. He and Cyrus uncover an international plot to… well, that would be spoiling it. Mycroft’s friend Cyrus is the descendant of slaves. This lets Abdul-Jabbar and Waterhouse explore the social context of the time (the later half of the 1800s) and, in particular, race relations both in England and in colonies such as Trinidad. It isn’t forced, but occurs naturally, in the way that Cyrus is forced, by context, to interact with others. This kind of social commentary is something that isn’t really present in Doyle’s original Sherlock stories, and helps distinguish this novel from the original inspiration, in a good way. The story starts off a little slow, with lots of background and setting the stage for the later half of the novel. But, then it quickly escalates, with lots of action and intrigue. Mycroft Holmes is an overall fine addition to Holmesian literature.